War isn’t clean, it’s not glamorous, and it costs a lot to survive it. Fury follows the story of an elite American tank crew fighting in Germany near the end of the Second World War. Fury is a heavy hitting movie. It relies on gripping set pieces, grisly mise en scene, and taught performances to convey the complexities of war. It strips away much of the sentimentality, the idea that the West were the ‘good guys’, and it subtly shows why the last remaining German troops were so fanatical – this was their homeland and they were prepared to die defending it. This is one of the core plot lines that Fury hinges on. It leans heavily on the idea that a fight requires two participants, and both of those participants have their own equally legitimate reasons for fighting. Fury’s story takes place right at the end of the Second World War as the allies near victory. This is a part of the war that hasn’t been documented in narrative film in quite the same way as some of the more ‘glamorous’ victories. Instead we follow our tank crew through German hedgerows and watch as they attempt to avoid Nazi child soldiers and the few remaining SS troops dug in across the country. There are many instances of shocking imagery. There’s the piles of bodies being churned up in the mud, there’s the tank crew that’s set on fire (one of them shoots himself in the head), and over all this is an unflinching account of one of the more famous conflicts. We often consider the Second World War to be a justifiable exercise. It seems to be simplified in our collective memory, and we perceive it as being necessary. Hitler was bad and we were good. It doesn’t have the same connotations as WW1, which was (and is still) considered a complete waste of life. Fury gives us a new spin on a familiar conflict and it shows that war is brutal, it’s out of control, and it leads to broken people, death, and macabre action. In terms of a message then Fury hits hard. Our tank crew is one that is battle hardened, apparently cruel, and somehow very lucky. They are still alive but most of their friends are not. This could be because their leader (Brad Pitt) is a skilled killer, survivor, and he ensures that they fight as a well-oiled team. But then the same could be said of his contemporaries and not all of them survived. The film is fast paced, it relies on set pieces, and most of them are very good. There are rolling tank battles, snipers in town squares, and occasional ambushes. At every point though the strength of the film is in its attention to detail. The soldiers move convincingly and the fighting is shockingly stark. There are no last minute reprieves and the soldiers aren’t explored as characters. Instead they are cannon fodder, men sent to die, in what can only really be described as mechanised murder. The narrative is a simple one and David Ayer sticks to it carefully. His writing and direction works well to move the soldiers across Germany. It’s April 1945 and the allied soldiers are nearing the end of the war. All that stands between them and victory is the last remnants of the Germany army. The tank crew is headed up by battle-hardened sergeant Don (Wardaddy) Collier (Brad Pitt) and his Sherman tank has a crew of five men. Their mission requires them to go behind enemy lines and there they discover that they are out gunned, out matched, and fighting against overwhelming odds. The supporting cast is good. Michael Pena, Logan Lerman, Shia LaBeouf, and Jon Berthnal all breathe life into character’s that could have been lost in the background. It’s a detailed film and it’s full of nuanced performances. There is a scene in the middle of the film that springs to mind and it revolves around a dinner table. It’s long (perhaps slightly indulgent) but for a moment it reveals who the characters are outside of the war. But then it’s back to the fight and the quieter moments are forgotten. It’s not particularly imaginative plotting but there is something compelling about the way that the story is told. It’s not about the characters, or even about the narrative itself, it’s all about the context. This is where Ayer really delivers stylistically and we are shown a vision of war that is terrifying and overwhelming. It’s a story about heroism within the context of war. It’s unlikely that most of the soldiers would feel that way but from an outside perspective that’s exactly what we see. They fight against increasingly ridiculous odds and they continue to chance their hand. But there is also something basic that the narrative rests on – the need for an underdog story and the desire for our heroes to survive. David Ayer plays with our expectations. He presents us with a realist war movie but one that has all of the trappings of a big budget Hollywood narrative. The conflict for us is in the desire for Wardaddy and his soldiers to win and make it home but this has to be reconciled with the knowledge that they really are lucky. And of course luck has to run out sometime. Ayer has a diverse back catalogue of film direction and writing. He is notable for penning the screenplay to Training Day (2001) and for writing and directing the more recent movie End of Watch (2012). 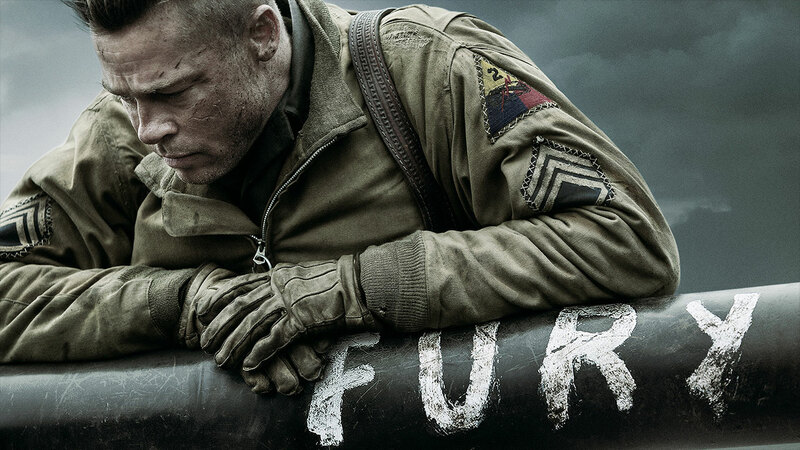 Fury is a much bigger, more ambitious movie but it’s one that marks Ayer out. His style melds the heavier thematic backdrop of war with the personal and human story of those fighting it. Fury is a good movie if a touch unimaginative. It delivers on the visuals and its depiction of war is stomach churning and unflinching. But it could be better and perhaps if David Ayer had toned down the didactic messages he would have found a more nuanced film. Fury is definitely a film that challenges our perception of war; it’s long, not easy to watch, but it’s compelling cinema.